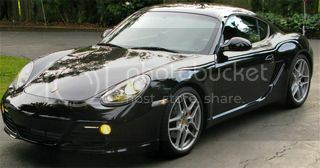 Has anyone done the HID Xenon head light bulb replacement on their Boxster? I'm not talking about the really expensive Litronics from Porsche but just the bulbs with transformer built in. Are they effective i.e. any better than stock head lamps? Does the blue cast create any issues? Are they really as easy to change out as the seller's claim? I have them on my car. Can't recall who I bought them from, but it was one of the online vendors (not via ebay) -- I can try looking for the seller details if you need me to. I got the lower wattage (35W) 5000K bulb -- did not want to risk damaging the headlight innards with a hotter bulb/higher wattage, and I know that the amount of "usable light" starts diminishing beyond 5000k (more blue, less white - but some seem to like that look). Indeed, most "factory" hids are at 4300K or so. IIRC, there are 2 ways to 'install' the hid kit. One involves drilling a small hole in the plastic headlamp cover. The kits supposedly come with everything you need to do this (excluding the drill, of course), but I did not go this route so I can't say. There is another 'compact ballast' kit, which can fit inside the headlamp unit (but it is a snug fit). The changeout is really simple, lighting is great (I have factory HIDs on my other car, and the kit light is comparable), and (what I really like) is that the process is completely reversible should I change my mind (so long as I keep the original H7s around). If we meet at any of the bay area drives/events (I'm back in a week), I'll be happy to show you the lights. Thanks for the info bigb. Are you going to the brunch in February? Hmm, needed to look up when that is -- Feb 7th, it appears. I'm not planning on coming to the brunch at this point, but will try to show up if not for brunch then for a drive afterward. I think I'll need that after a big deadline I have on the 5th of Feb! I think it's the 6th, second Saturday every other month. I installed ACG's slim ballast kit on my Cayman and it was an easy 15 minute job. I did not stuff everything into the headlight unit - I feel this would create potential for concentrated heat down the road. I have 6000k and 3000k bulbs....depends on my mood. Actually, I haven't decided on my AX plans. I'm considering sitting out this season for a few reasons. Karting is going great. I did well in my 2 classes and I'm really looking forward to the race season which starts in April. I'd like to still AX but issues with juggling tires and wheel sizes leave me wondering what I want to do. BTW, my 7mm spacers have been driven. However, my 14mm spacers have not. I installed one, mounted a wheel on it, discovered that I didn't have the clearance for it so I took it right back off. My wheels are wider than yours which affects my offset so you wouldn't have that problem.